Filthy, dirty makeup brushes are one of the dirtiest little secrets of the beauty industry — one for which there haven’t been fast, easy, thorough solutions. So it’s no surprise that beauty lovers, and acne-fighters, keep trying to solve this problem, especially for women with lots of brushes. My Brush Betty’s research shows that is about 25% of the female population! If you’ve been reading this site, you know that makeup brushes often harbor bacteria deep in the cuticle of natural animal hair, as well as the textured surface structure of many advanced synthetic fibers. Once makeup, dirt, bacteria and facial oil get good and embedded into those microscopic nooks and crannies, it’s notoriously difficult to remove. My Brush Betty, as you know, has it’s own most excellent solution, which you can read about here. Microscopic view of a powder test with synthetic fibers and real animal hair. Photo courtesy of Taiki USA, Inc. 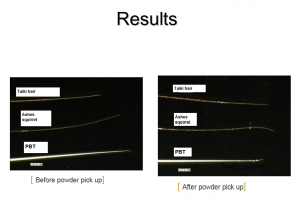 Old-fashioned synthetic brushes, such as Taklon, had a super smooth microscopic surface structure that prevented gunk from getting stuck in the brush fiber. It also had the negative effect of not picking up powder very well. 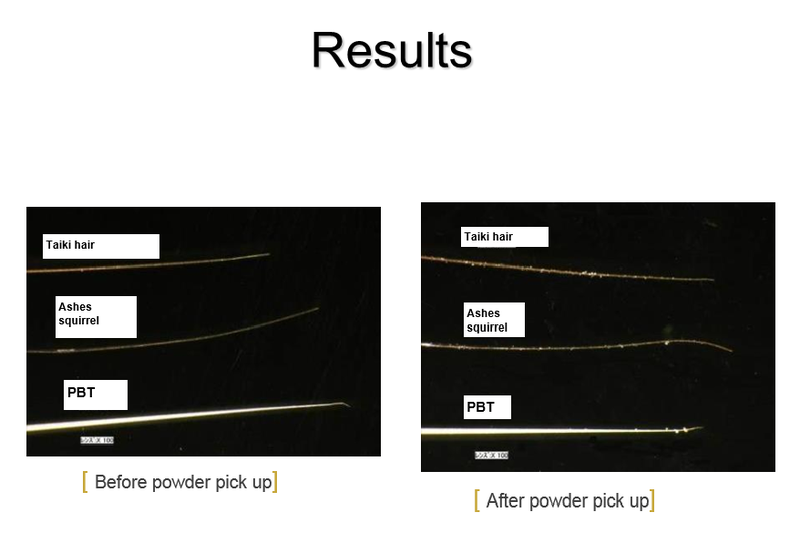 So many modern synthetic makeup brush fibers, such as DuPont’s Natrafil and Taiki’s Tafre, in an effort to improve their pickup and payoff characteristics, have a textured surface structure that more closely resembles animal hair. The Brush Medic Pro model is being offered exclusively beginning November 14th on Indiegogo for special pre-­order pricing, starting at $199 of limited quantities expected to ship in April 2015. Company representatives stress that supplies are limited for this offer and delivery date. The price of the machine will go up to $299 after the 45­ day campaign and will be available in select retail stores by June 2015. The company also offers a $69 Mini version, a wall organizer drying rack and a cleaning kit all available on Indiegogo or at: http://www.BrushMedic.com. Now rather than belabor the limitations in the Brush Medic — it doesn’t, for example, take the work out of thoroughly washing brushes — we welcome any and all solutions to the market that help women keep their faces clean. As My Brush Betty says: A Clean Brush = A Clean Face! At the moment, the Brush Medic is soliciting support on Indiegogo, so take a looksie and see if it’s a solution that works for you!